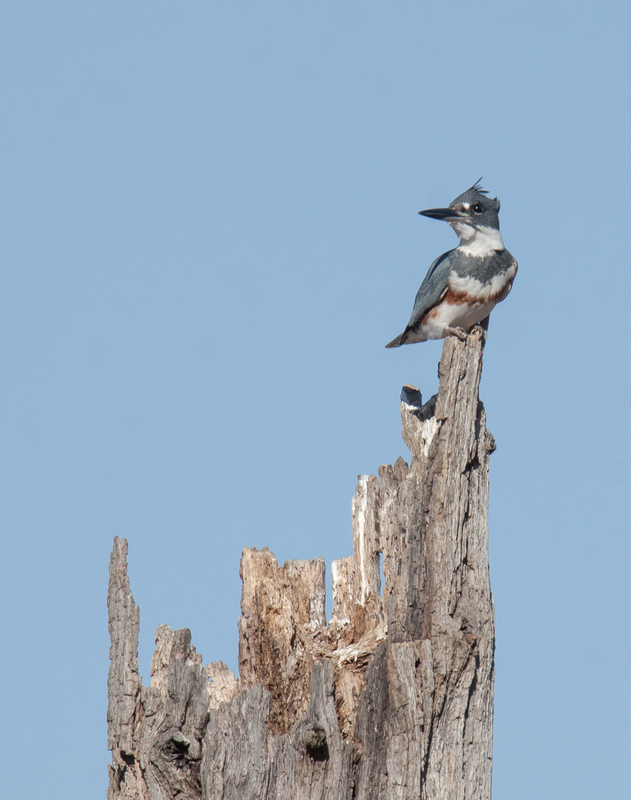 Recently, while exploring the streams in the remote back areas of Huntley Meadows Park, I have heard the unmistakable call of a Belted Kingfisher (Megaceryle alcyon) several times. Yesterday, on a warm spring-like day, I finally got a clear view of this beautiful female. As I have mentioned before in some earlier postings, Belted Kingfishers are unusual in the bird world—the females are more colorful than the males. Females have a blue and a chestnut band across their white breasts and the males have only a blue band. I saw a kingfisher just yesterday. Whether it was male or female, I don’t know, because I was driving and only caught a glimpse. But, I didn’t know that the females are the more colorful — next time I see one I’ll give a closer look. I love kingfishers, although the sound of their call is a bit grating on the ears. If you see that chestnut band on the chest–it’s a female. For some odd reason, most of the ones I have seen have been females. Photogenic and in the open, much nicer than hiding among the branches of a tree. She’s a beauty – very nice shot! Congratulations, Mike — you photo’d the Belted Queenfisher we heard last time we photowalked together! And I admit I stole your punny name for female Belted Kingfishers.